Tonight, a 76-foot Norway Spruce, topped with an enormous Swarovski star became the focus of the nation as we celebrated the 81st annual Rockefeller Center Christmas Tree Lighting Ceremony. The tree topper wasn't be the only star present. Mary J. Blige, Toni Braxton, Mariah Carey, Kelly Clarkson, Kenny "Babyface" Edmonds, Goo Goo Dolls, Ariana Grande, Leona Lewis, Lauren Alaina and Jewel performed both holiday classics and popular hits during the celebration. The tradition of the tree lighting ceremony at Rockefeller Center goes back to 1933, when the tree brought hope to the country during the Great Depression. Lit with 700 lights, the three glittered in the night in front of the RCA Building, which at the time, was only eight months old. Today, the tree is still lit with the same spirit, but with a few more lights: 45,000 to be exact. 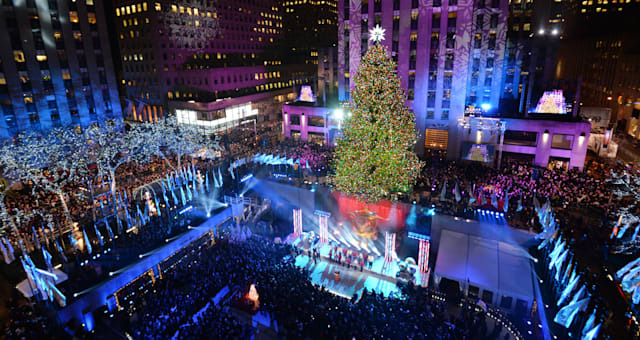 The tree, which weighs a whopping 12 tons, made its way to the center of Manhattan from Shelton, Connecticut and will remain lit until January 7, 2014, attracting tourists from all over the country and all over the world.